Bye Bye street cred, hello handy shopping trolley! I am the wrong side of 40. 40 in fact is beginning to be a bit of a distant memory. I tell you this in the hope that it will in some way mitigate what I am about to tell you. I bought a shopping trolley. Yup. Despite my husband's vow to divorce me if I brought one of the two-wheeled old lady bags home, I was tempted beyond resistance and bought one. Let me explain. This week I went with friends to the Ideal Home Exhibition at Earls Court in London. I went armed with comfy shoes, a drink and snack and my big "blogger" cross body bag which I usually use to ferry camera and spare comfy shoes to blogger events and take home the lovely goody bags we are often given. But after having to lower myself painfully to the floor to eat lunch at the show, and then even more painfully drag myself upright again afterwards and as my bag began to drag more and more uncomfortably across my neck fate delivered me to one particular stall. Shopping trolleys in every shade and design were on display. I paused with the threats of divorce echoing in my ears. 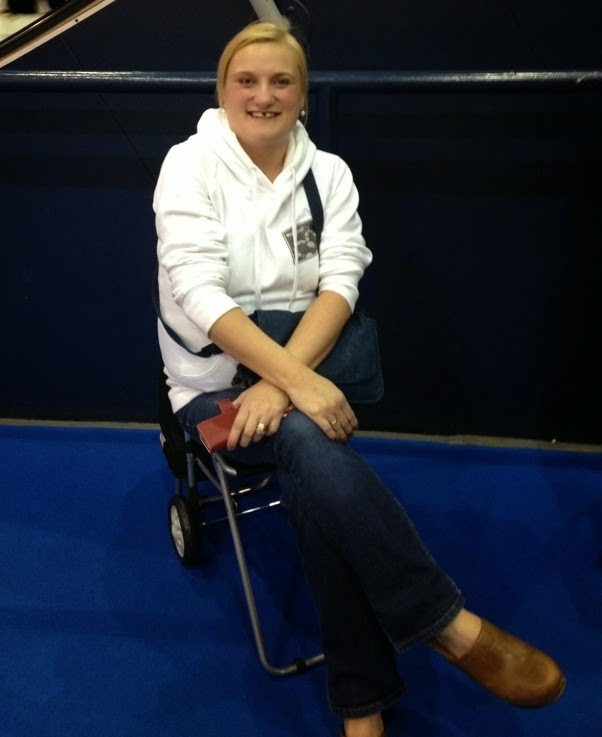 Then the lady manning the stall demonstrated this particular trolley's extra feature. It comes with a fold down seat! Well dear reader what can I say! I was hooked! 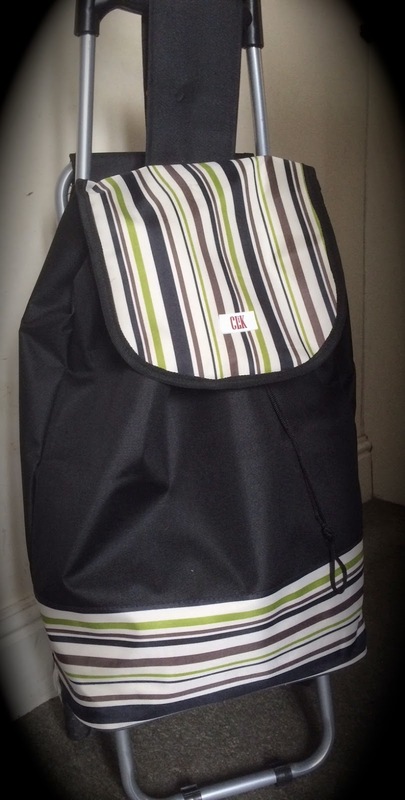 I handed over some crumpled notes and chose a black and lime green striped design which I deluded convinced myself was less pensioner-y than some of the others. My (younger) friend sniggered and started to back away. 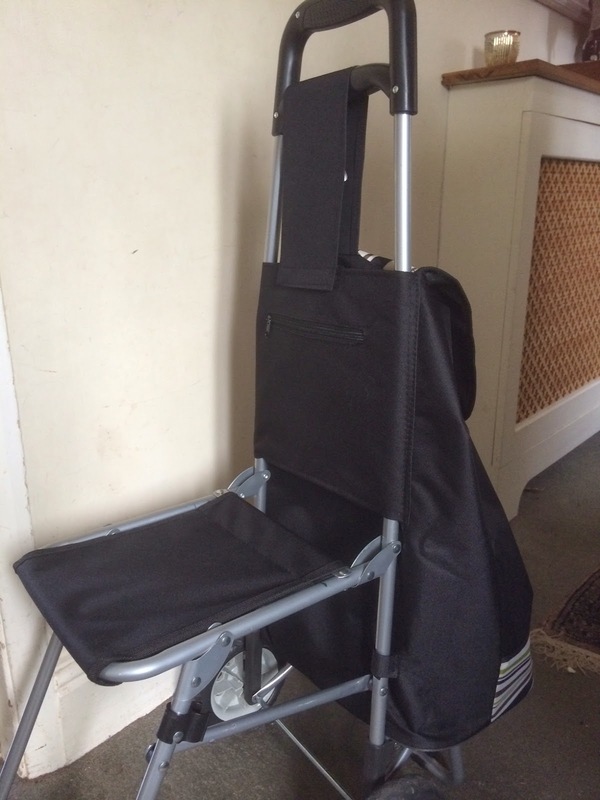 My slightly older (but still younger than me) friend urged me on, possibly because she had already fallen prey to the shopping trolley temptation at Christmas when we realised with all our children at school we no longer had a buggy to hang all our purchases on. DS#1 and FDIL had wandered off so were surprised and delighted when they spotted me resting on my new purchase. Well I think that's what their facial expressions represented - although some might have interpreted them as shock and horror I suppose if I'm being honest. I ,however was over the moon! All my heavy bags loaded into the trolley I dragged it round all day feeling smug. So many other people had them I didn't look odd at all - well, no odder than I normally do anyway. And it came into its own on the way home. Packed train, standing room only except for me after I unfolded the little seat and plonked myself on it. Apparently it can take 20 stone of blogger (or anyone else in fact) and I'm nowhere near that so felt quite secure perched on it. The following day I was going back into the capital for a couple of blogger events so loaded up my trusty trolley with DSLR, travel coffee mug and a spare bag leaving plenty of room for any goodies I might pick up during the day. I negotiated the train and tube with not too many toe squishing incidents and entered the first event with no-one laughing and pointing. It was great to keep all my stuff - coats, bag, scarf etc- all in one place instead of spreading myself around as I normally do. It was a bit of a different story at the next event. Held in a rather posh venue often featured in Made in Chelsea (I'm reliably informed) I may have looked slightly out of place among the fake tanned, smart young things with their dates in sharp suits. Bearing in mind I teamed my biddy bag with a pair of eccentric lime green clogs (to match the stripes) and a skirt with mad birds on I may have stood out somewhat. But let me tell you, when it was time to leave lots of friendly fit young men rushed to help me lug my now heavily loaded trolley down the stairs. Who knew that an old lady trolley could break the ice so easily? Obviously as a happily married mum of 7 I took the initial contact no further but if you are a single woman it might be a wise purchase - carry your shopping and meet young handsome guys at the same time! Result! Anyway, I am very happy with my purchase and will be dragging it round all future blogging events so feel free to come over and admire it and say hello! I don't know whether to be embarrassed or proud! But I really love it! Sounds brilliant. I want one! Perhaps I could cart my two-year-old round in it too! Great post :-) My nan always had a very old fashioned tartan shopping trolley but I don't think I could bring myself to buy one! OMG Afra i could so do with one of these for Britmums Live!! i love it! Fantastic, I'm in my 30's and had a shopping trolley for nearly 3 years now. Its amazing, I love it although I am very jealous of your fold down seat. Amazing!